Recently, there was a bad car accident out on one of the local highways. It wasn’t the typical busy big city main highway, but certainly busy compared to some. The vehicle had swerved off the side of the road, over-corrected, swerved back to the opposite side of the road, hitting the guardrail causing it to flip over on its roof. Lots of cars slowed down, and moved out of the way. The cars were certainly diligent in cooperating together to uniformly move out of the way, forming a single file line in the opposite lane to get safely by. Every single driver curiously looked at the accident as they passed by. Most shook their head in disbelief, and pity. Many shook their head in sadness for whoever was in the car. Some drove by with simple curiosity. One person driving by even sent up a prayer to God. After what seemed like dozens of minutes having passed, all the cars were gone and the roadway was quiet once again except for the sound of a hissing radiator and one of the tires still rattling in a spin. When I was about 5 years old, I remember standing in my room one morning as my father was rushing around the house getting ready for work. He walked in to my room, with his undershirt still to be put on and said something to me, which I don’t remember. As he turned around, he flung his t-shirt over his head and walked out the bedroom door and on down the hallway. So, the next morning, I set out to do just like my father had done before me. I carefully thought the whole thing through, plotted my course, and selected the shirt I would attempt to put on while walking through the doorway of my bedroom. “Okay, here goes!” I took my first couple of steps toward the doorway. “Good bye mom, I love you!” seventeen year old Cassie told her mother as she walked out the front door and hurried off to school. It was a day like any other, running late, homework to finish before afternoon classes, and normal teenage life in the high school to deal with. While at school that morning, she handed her friend, Amanda, a note. Little did either one of them know that would be Cassie’s last day here on earth. 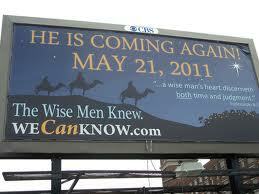 Sure enough, it read, “Judgment Day, May 21st, The Bible Guarantees It,” followed by a website address. ‘Oh boy,’ I thought to myself, ‘this should be good.’ So, I went to the website later on that day to take a look. At first glance (ignoring all the images, banners, scrolling text, and advertisements, of course), I thought it didn’t sound so bad… Parts of it read, “…While just about every church has a different idea as to what the Bible teaches concerning the end, they all seem to agree on one thing; no man can know the day or the hour of Christ’s return because the scriptures say that He is coming as a thief in the night…” And then it was downhill from here. Google has nearly 5.2 million digitized books now. 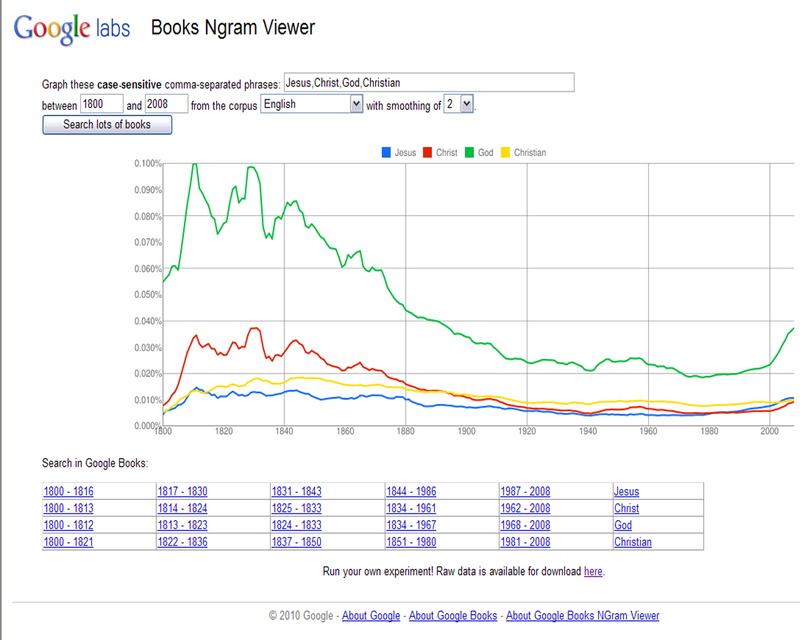 Recently, they came out with a database called Google Books Ngram Viewer, which is a ‘digital storehouse, which comprises words and short phrases as well as a year-by-year count of how often they appear…(it) consists of the 500 billion words contained in books published between 1500 and 2008 in English, French, Spanish, German, Chinese and Russian.’ It really is a fascinating thing, and someone can easily waste hours searching and comparing words and phrases off all kinds. Of course, if that sort of thing interests you. From the early 1800’s, books that mentioned God (out of the four words searched) ranked the highest. 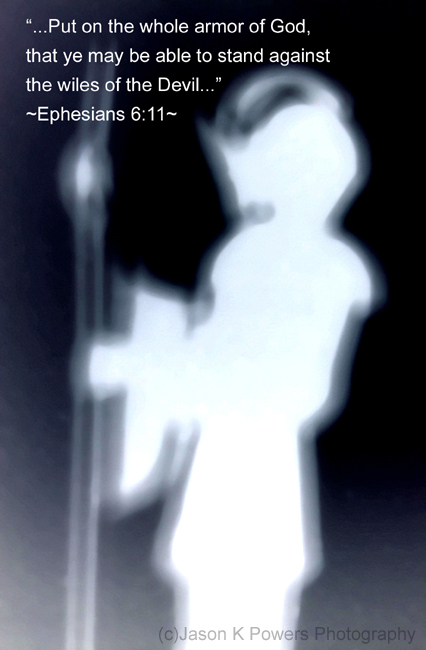 Christ came in second, Christian came in third and Jesus, oddly enough, came in fourth.